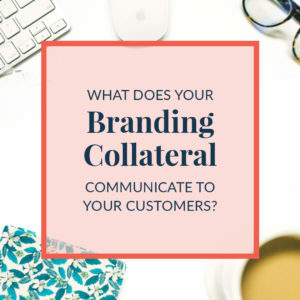 What Does Your Branding Collateral Communicate to Your Customers? Think of all of the big brand logos out there. Those big friendly arches of McDonald’s, the swoosh of Nike, the softness of the Pillsbury Doughboy… Something that all of the world’s most valuable brands have in common is how well they communicate their brand’s message and values without one single word. Now, take a look at your logo. If this was the very first time you saw it, would you know what your company is about? Hiring a virtual assistant to revamp your entire brand, from your business cards to website, to branding collateral, to your social media graphics, can help you develop a brand identity that will communicate your values and better connect you with your customers. What Does Your Logo Communicate? Humans are visual creatures by nature and we form opinions immediately based on the most superficial of observations. In the case of a business, our very first exposure tends to be the logo. If you’re going to be branding all of your collateral with your logo, you really need to ask yourself what it is communicating. Designing a great logo goes beyond simple graphic design. It’s an art. You need a logo that is simple, attractive, engaging and communicates your brand message. It needs to look good on everything from your business cards to your website. A great logo isn’t something that you can come up with in an afternoon. It can take many drafts to get it just right. If your logo hasn’t been touched for years, then it might be time for a refresh. We have experience in creating logos that tie in perfectly with a company’s already existing colors, website, and design language. If you want a modern, stylish logo, you’ve found the graphic designers to create it!Your branding is your business so make sure that you have a fantastic logo! We spend so much of our time talking about the digital marketing sphere that we sometimes forget that there is an entire real world out there! Your physical marketing collateral is basically anything that you use to communicate your brand to someone. It could include your business cards, envelopes, brochures, product packaging, direct mailers, and more. They should all prominently feature your business’ logo. When you send a letter to someone, you want them to know that it’s from you before they even look at the name on the envelope. Similarly, if you ever plan to do any physical freebies or giveaways, you will want to make sure they are well branded with your logo. Let’s say that you are handing out candy in a local parade (a great real-world marketing opportunity, by the way). You can get custom candy wrappers made so that, although there will be Skittles inside, the packaging will be all you.Do you know what your branding collateral actually communicates to your customers? Your branding is much more than just your logo, of course. It encompasses your entire design, from your business’ colors to the font you use on your website. It’s essential that all of your branding is consistent across your marketing materials, both physical and digital. If your business cards have your old logo on them, but your website has your new one, that discrepancy won’t reflect well on your business. Likewise, you need to make sure that you are correctly branding all of your social media channels. Although you can’t do anything about the colors of Facebook (Hey, if your company uses blue and white, you’re all set! ), you can have a perfect banner and profile photo designed so your business page will be unmistakably your own. Then you can do the same with Twitter, LinkedIn, and Instagram, just making some small tweaks to each based on the platform. Just like I said about logos, branding is an art. You can’t merely create a first-draft logo, pick some colors, and off you go. Everything about your brand needs to scream your business, creating a positive brand reputation. Then, once you have everything about your branding all set, we can help you get it out there with your physical marketing collateral, email campaigns, social media profiles, and more! Contact me today if you’d like to get started building your brand in a way that will get you noticed!